Aerodynamic shell with large eye port opening for greater visibility. Advanced Ventilation System: Adjustable dual forehead and chin vents. Two rear exhaust vents and chin bar vent helps to diminish shield fogging. Plush, brushed Nylex® interior lining that is removable and washable. Rapid Fire™ Shield Replacement System for quick, secure, tool-less shield removal and installation system. Aerodynamic, flush-mounted shield fit for reduced turbulence. Rated to block 95% of harmful UV radiation. Construction: Advanced Polycarbonate Composite Shell. Weight: 3.19 lbs / 1449 grams (approx, based on size medium solid color). 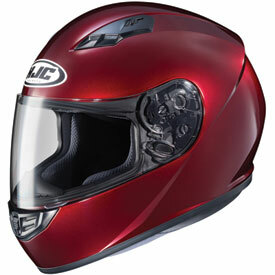 Very good helmet at any price. Just got back from a 5 day 1400 mile ride through the Sierra Mtn's and was in complete comfort the entire trip. Bought the large size and fit perfectly. Easily the most comfortable, best value helmet I have. Fit and finish impressive for the money. Definitely recommend. Yes will buy again. About as quiet as any I have worn.